Need just for the lock ring. Wish the lock ring was sold separate. Closed transfer from Speidel to Keg. Add to top of Speidel. need the collars for the Thermowells. My spigot is leaking and I just nuked my 6gallon batch of Cider, getting ready to ferment. I decided to buy an extra one of these to use as a blow off on top of the fermenter instead of the large airlock. It matched the one which started to leak, but only after about 15 years. You dont seem to sell the replacement gasket, so I hope it comes with a new gasket which is what I really need. Because the fermenters only came with one locking nut and you need two if you want to use mods. 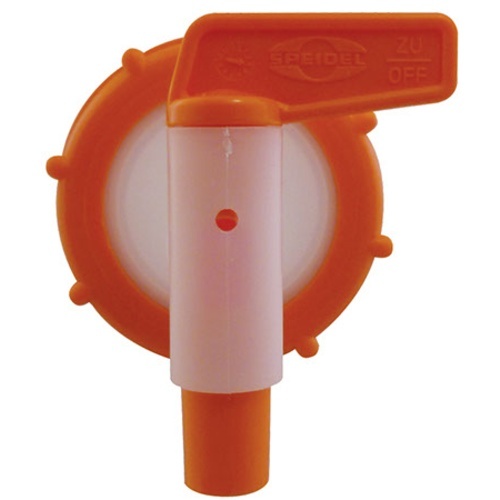 How do you take the Speidel spigot assembly apart so that you can use the sleeve to attach this dip tube? BEST ANSWER: The orange spigot will come out of the white plastic piece, it will take a good push. I press the bottom (where the beer comes out) against my counter while rotating the handle. It will pop out, then the whole thing comes apart. I found that you can reassemble the spigot from either direction and it provides a lower or higher position for the drain, check when you reassemble which way you want it. Turn the spigot so that it is perpendicular to the orange ring, then hold the white piece and push the spigot up and out. Sometimes it helps tops the white part into the ring from the back, and push down while holding everything on the edge of a table or something. The white plastic part of the spigot pops out. Use the same silicone washer that comes with the plastic one and slide the dip tube through the open orange thread. Viola! You would just need the orange threaded cap --- twist and remove the orange lever. then you can easily remove the white plastic part. Those who mentioned problems with leaking here should be careful to correctly fit the included O-ring to the white plastic sub-assembly before securing the locking ring. Also, the orange part of the valve is difficult to disassemble the first time, but if a little keg lube is used prior to reassembling, all goes together easily with just finger pressure and the valve is easy to operate. The plastic spigots for the Speidel Plastic Fermenters are okay but I have found that over time they start to leak. Basically they work fine until that happens but they do need to be replaced from time to time. Insert about the first 3 inches of your 3/8 inch pvc beer line into very hot (about 180 deg F) water for about15 seconds to soften it. Work quickly and slide tubing all the way, as far as it can go, onto orange spigot end. This makes for a very reliable connection, once it cools, so long as you do not pull hard on beer line. Works for me! This spigot is the only weak point to Spiedel fermenters. They are oddly the wrong size for standard homebrewing hoses. To attach a 3/8" vinyl hose I have to stretch it with pliers first, and then try not to skin my knuckles putting it on. A 1/2" hose is too big. Opening and closing the spigot also rotates the attached hose, which can lead to it falling off or other messy issues. Spend the money on the chrome spigot and you'll be happier with your Speidel! Insert about the last 3 inches of your 3/8 inch pvc beer line into very hot water for about 15 seconds. Work quickly and slip onto spigot end. Make sure it is pushed all the way on, as far as it can go. This makes for a very reliable connection, once it has cooled, so long as you do not pulled hard on beer line. Works for me! I use a 3/8 in silicon hose, which fits nicely on the spigot. Both spigots work great but they are a little tricky to put back together after cleaning them. If the orange spigot is not fully inserted back into the holder, it may leak. Mine really has to be forced down until it snaps into place. Also these do include a gasket. Not sure why others have had leaking issues. NO leaks here, with 12 gallon batches! This nozzle can also be used on the TOP of the fermenter, which you can use to attach tubing for an airlock - AND to apply a SMALL amount of pressure with CO2 to force the beer out the bottom nozzle, and into kegs (or through a filter between the fermenter and keg, saving time and effort). LOVE IT! I have seven fermenters of various sizes. This spigot is unreliable as far as leaking. All of the spigots have leaked at various times. I have to keep turning the valve back and forth to get it to stop leaking. I have one that won't stop leaking. Poor design. I will replace the spigots with solid caps. Speidel makes high quality items, this is no exception.